Gingrich's Health Care Consultancy: Is It Lobbying? The Center for Health Transformation brought an electronic medical records company to Washington to meet with congressional leaders and a Cabinet official. But the former House speaker and now presidential candidate says that's not lobbying. Gingrich's Health Care Consultancy: Is It Lobbying? Former House Speaker Newt Gingrich, shown at an event on health care on Capitol Hill this March, founded the Center for Health Transformation. In between his speakership and his presidential candidacy, Newt Gingrich built a network of organizations to promote his causes — and himself. Informally known as Newt Gingrich Inc., those entities have flourished. But questions linger, especially about two of them: the Gingrich Group, a for-profit consulting firm; and a unit of the Gingrich Group called the Center for Health Transformation. The Gingrich Group doesn't do the shoe-leather lobbying that's covered by the federal disclosure law. Yet the Center for Health Transformation, one of its big projects, illustrates the kind of Washington activity that lies beyond the reach of the lobbying law — activity that still can look an awful lot like lobbying to outsiders. The Center for Health Transformation isn't a think tank, and it isn't a lobby shop. Defining just what it is isn't easy. "They want to say, 'Well, isn't that lobbying?' 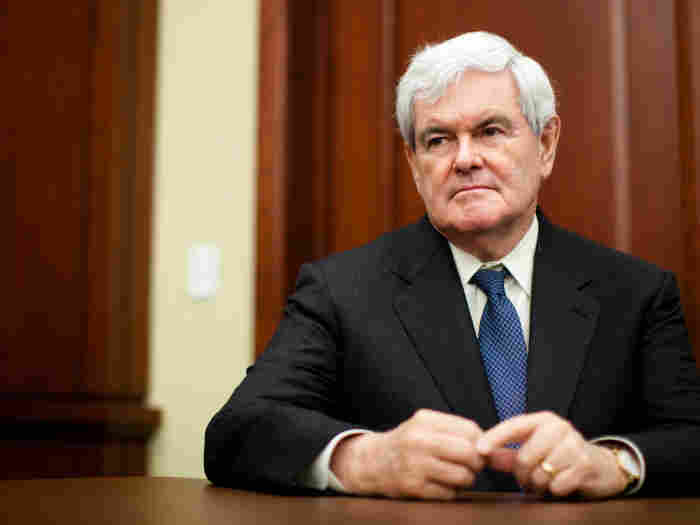 No," Gingrich told Sean Hannity of Fox News last week. "That's called being a citizen. As a citizen, I'm allowed to have an opinion." The center's CEO, Nancy Desmond, told NPR: "We have actually had people refer to us as more of a 'think-and-do tank,' because it's not about just thinking about things; it's actually doing them." If you're studying something, and you come to conclusions, and you advocate for a particular position, that's advocacy. That's lobbying. The Center for Health Transformation doesn't have clients; it has members — 93 last year, accounting for about $6.9 million in annual dues. One charter member from 2003 is HealthTrio, a firm that provides systems for electronic medical records. Back in 2003, Gingrich testified to a Senate committee about the need to move from paper records to digital systems. He singled out one visionary for praise: the head of HealthTrio, which runs an electronic health record program for Brigham and Women's Hospital in Boston. In 2004, the center brought HealthTrio executives to Washington to meet with congressional leaders and with the secretary of health and human services. It also recommended that the Congressional Budget Office change its standards so that switching to electronic records would look better on agency budgets. HealthTrio and the Center for Health Transformation also took their case to state governments. And HealthTrio has the center educate prospective clients. HealthTrio doesn't regard this as lobbying, says Dave Syposs, a vice president of the firm. "We looked for them as not a lobbying vehicle but more of [an] educational and informational vehicle for us," he says. It wasn't even lobbying, he says, when the center arranged those visits with congressional leadership. "Our owner, Dr. Malik Hasan, has had, certainly, opportunities to meet with several of the senators and congressmen through his own personal introductions and through some of the members at the Center for Health Transformation," Syposs says. And the Center for Health Transformation's Desmond says Gingrich was always a valuable asset in meetings — but not because of his political clout. "Obviously, because Newt is such a well-known person, and beyond that he's so incredibly intelligent," she says, "it's helpful to have him as part of the discussion." Among those who have puzzled over the Center for Health Transformation — and just what kind of creature it is — is political science scholar James Thurber of American University. "If you're studying something, and you come to conclusions, and you advocate for a particular position, that's advocacy," says Thurber. "That's lobbying." But ultimately, Thurber says, the center has been simply a vehicle for Gingrich. "I think that it was a love of Newt to push for health care reform, and he used it to pursue that love or interest, but also used it to make a great deal of money," he says. Desmond says the Gingrich Group, including the Center for Health Transformation, grossed nearly $55 million over the past nine years. Gingrich's own financial disclosure statement, filed this summer, says that he stepped down as chairman of the Gingrich Group in May. His one continuing tie: He still serves on HealthTrio's advisory board.